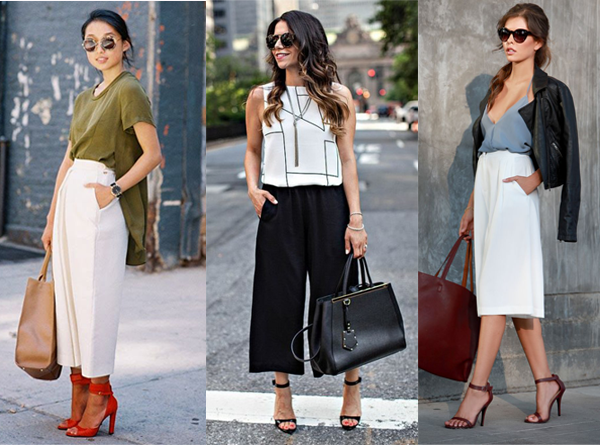 Today, we’re looking at culottes – which can be intimidating at first glance! It’s the trouser trend that everyone is talking about this season, with somewhat divided opinions. Being a skinny jean and trouser obsessive, I wrote them off at first as not for me. But having seen some fabulous style inspiration recently, I must admit they are growing on me! Dressing for work during summer can be tricky and for me, this is where culottes make perfect sense – they appear light and breezy but polished and chic all at the same time. When it comes to wearing culottes, tailoring is key and it’s important to balance out your top half with something more fitted or tucked in. A smart blazer is perfect for work or the stunning longline waistcoat below from Warehouse makes for a gorgeously sleek look!